I am Rahamath Ulla. I am from a small village called Ramnagar, near Tumkur. 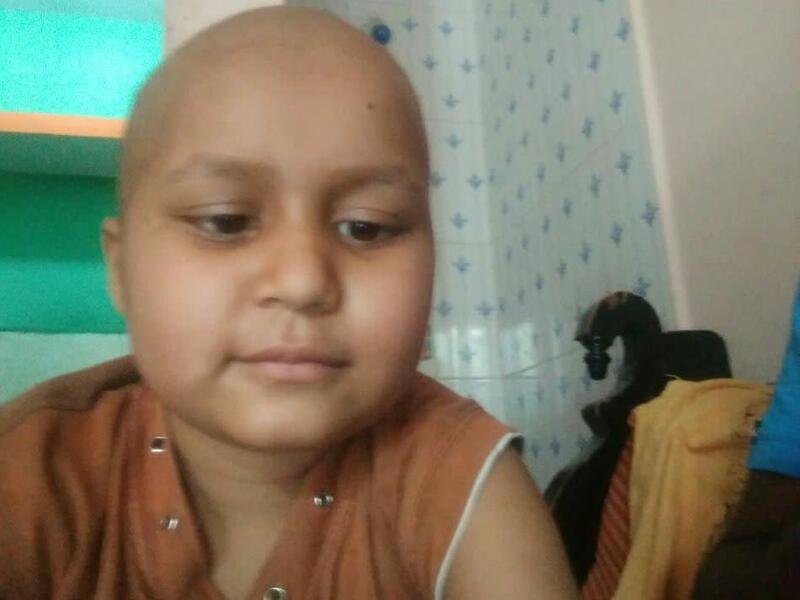 It was earlier this year I got to know my 8 year old daughter, Tasmiya is suffering from blood cancer. With bare minimum facilities available in Tumkur, I decided to bring my daughter to Bangalore to give her the best treatment. Her chemotherapy sessions have started at BGS Global Hospitals. Doctors are positive with a aggressive chemo sessions, Tasmiya could be completely cured. I work as a driver and get a maximum of Rs. 400 for a trip. With constant hospital follow ups, my service has dropped too. 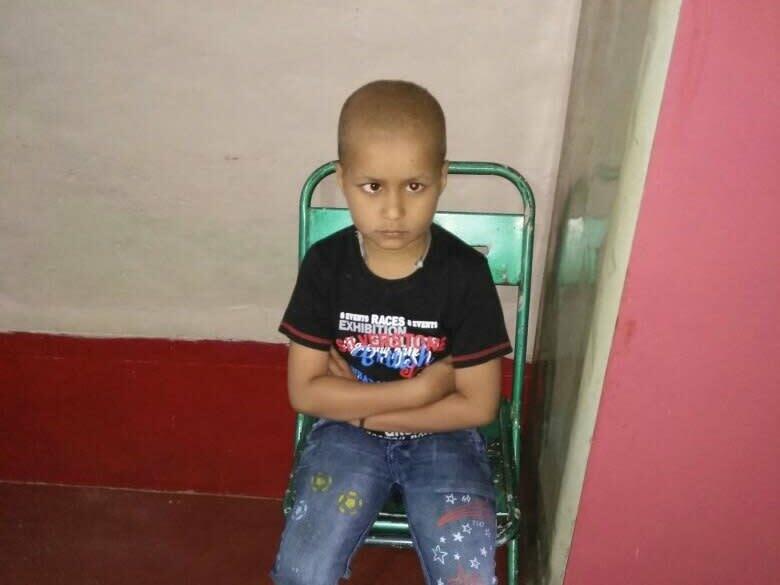 I have been struggling to arrange for the chemo sessions and medicines but have managed to pay for his treatment by far with help from family and relatives by loaning the funds. But to arrange 10 lakhs is next to impossible. As his father I cannot give up. The only way to save my daughter is by your support. Please make a donation and support us. How can you help this father? 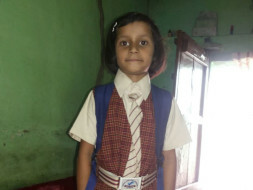 Tasmiya is doing a lot better and has been attending school regularly and she is very happy. There are regular tests are ongoing and she is showing a significant amount of progress. Her right eye had lost vision due to clotting of blood at the retina but is improving with therapies, it is squinting as time goes. Doctors say her vision will be back and squinting might go away! A million thanks to the donors for the help, will post updates as and when there is more progress. The last round of chemotherapy for Tasmiya got done on September 18. Now that the toughest part of the treatment is over, Tasmiya is very cheerful and has started playing with her brother again. 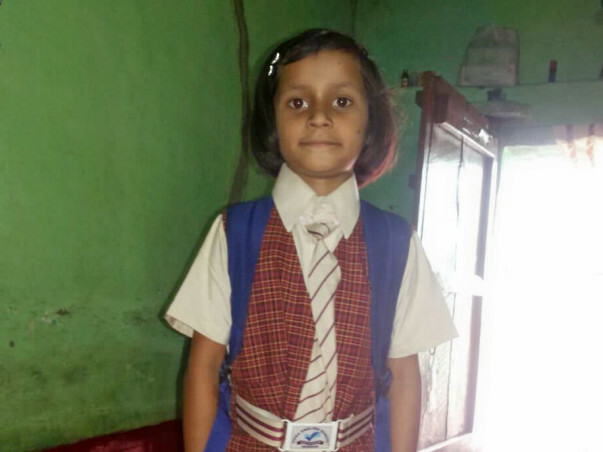 Tasmiya, her brother and their parents returned to their hometown in Tumkur on October 9, after a go-ahead from her doctor. All the blood-test reports are also normal. Tasmiya loves to cycle and goes out for cycling every morning and evening around the neighbourhood. However, since her doctors have advised it that she does not mingle with people outside home for too long. For the next two to three months this is essential because of the risk of infection. She has to take a lumbar puncture every 15 days for the next three months as a part of maintenance chemotherapy. She will be able to join school only in January. Tasmiya is eagerly looking forward to it. Rahmatullah, Tasmiya’s father, says “I would like to thank all contributors and Milaap once again. Tasmiya is now healthy because of all of you”. I am Sudhakar, a Milaap Open Fellow in Bengaluru. 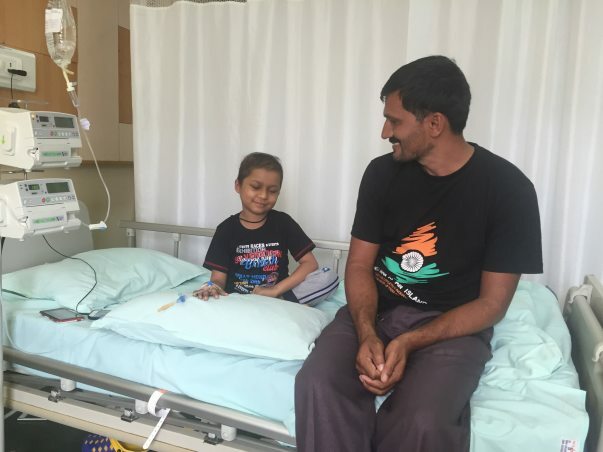 I met with Tasmiya and her father, Rahamath Ulla on 19th July at BGS Global Hospital, Bengaluru while her fourth chemotherapy session was in progress. Little Tasmiya and her brother, Mohammad Huzer were busy playing a game “Ulta Pulta” on the phone borrowed from her father, when I visited them. 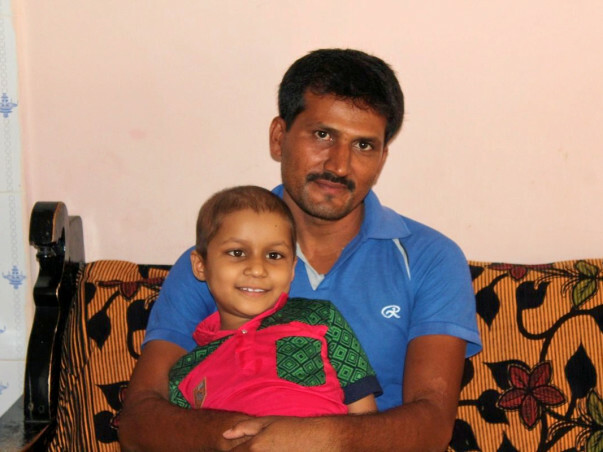 Tasmiya’s first chemotherapy session was on 30th May. She has been undergoing chemotherapy session every 15 days since then. The current chemotherapy session was delayed by a week because the platelets count were not as high as desired. Tasmiya’s father has rented a house at a driving distance of 15 minutes from the hospital. Hearing about Tasmiya and her fight with cancer, the landlord waived off the usual security deposit required for renting a house. “We first came to know about Tasmiya’s condition on 23rd Jan 2016. 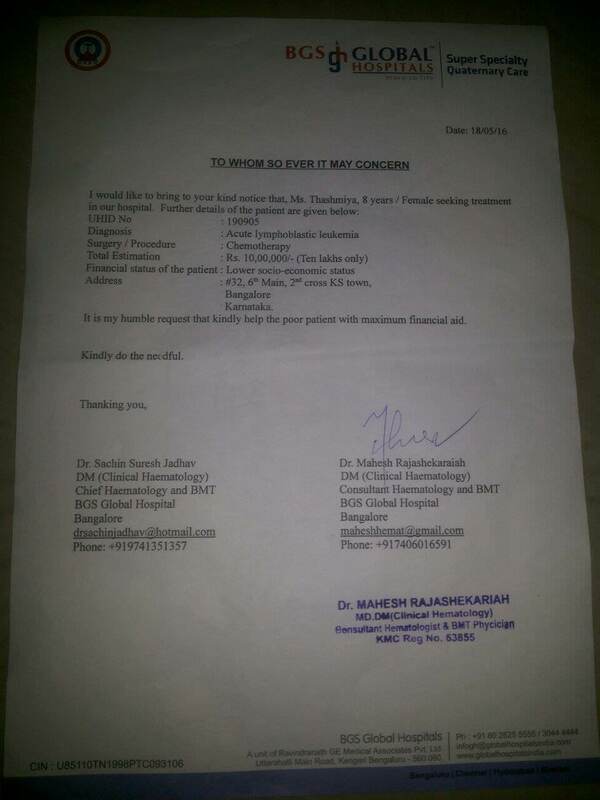 I was worried about how I would manage the entire finances required for the treatment . 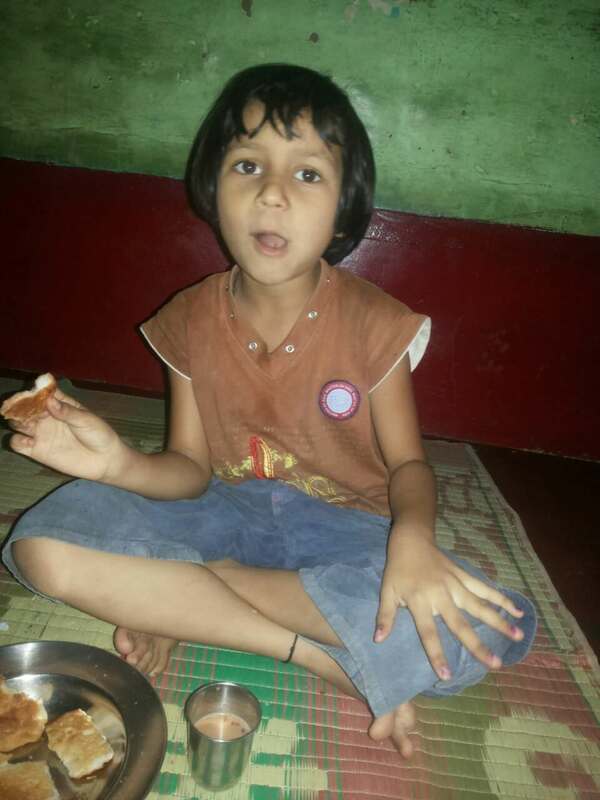 But, because of good samaritans like the contributors at Milaap and my current landlord, I have been able to provide my daughter with the needed treatment,” said Rahamath Ulla, expressing his gratitude for everyone. Blood tests will be conducted a week after the current session of chemotherapy to ascertain the further course of treatment. Tasmiya has been responding well to chemotherapy. She had no other option but to discontinue her schooling. She is in the 3rd standard. She will resume the same grade once she joins back after the treatment ends. Let’s all pray for her quick recovery so that she resumes school at the earliest.